The October email newsletter was recently sent out to subscribers with up-to-the-minute news of upcoming programs and events this month. 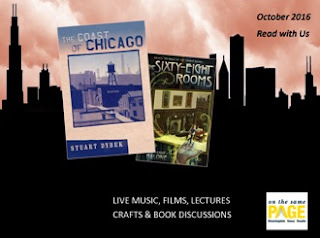 Find out all about On the Same Page, this year's collaborative community read featuring Stuart Dybek's The Coast of Chicago with programs, events, movies, and, of course, book discussions at Bloomingdale Public Library, Itasca Community Library and Roselle Public Library. Mark your calendar now for LEGOs and Halloween events in Youth Services. Discover opportunities to support your Library by supporting the Friends of the Library Fall Book Sale and the Friends fundraising dinner at 1913 Restaurant and Wine Bar. In addition to Library programs and events, learn a little bit about Roselle history in the Pic from the Past feature from the Roselle History Museum Digital Archive. You, too, can stay on top of all your Library has to offer and learn about your community's past. Take a look at the current eNews, then sign up to receive the next issue in your email.